1 Texas shaped container of M&M's- OR- 1-ish cup. Cream butter and sugar. Add in egg and extract and blend. The combine flour and baking soda- mix until completely incorporated. Fold in the M&M's. Dump into a greased 9.5" pie pan and bake for 25-30 mins. You know the drill, when a toothpick/ridiculously small pairing knife comes out clean it's donzo. 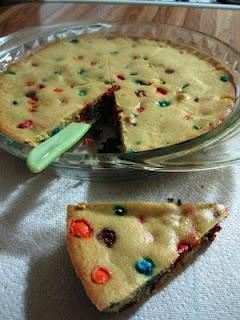 Cool, cut into cookie pie slices and enjoy! "No white sugar? "- NOPE. the brown sugar and M&M's are the sweet in this recipe. "Can I bake it in an aluminum pie pan? "- you sure can! "what's the texture like? "- it's a cake-like cookie. NOT a greasy thin cookie cake like you get at a supermarket.